Image of members of Bone China Band (Dan West on banjo, Willie P. Bennett on vocals and guitar and Mike "Major" Gardner on bass) performing under a tent. Photograph taken from below resulting in a dramatic foreshortening effect. We acknowledge the financial support of the Department of Canadian Heritage through the Canadian Culture Online Program. | Nous tenons ï¿½ souligner le soutien financier du ministï¿½re du Patrimoine canadien par le biais du Programme de culture canadienne en ligne. 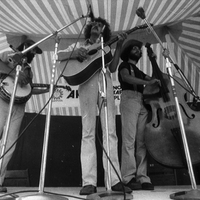 Keith R.Buck, “Mariposa Festival 1975,” York University Libraries | Clara Thomas Archives & Special Collections online exhibits, accessed April 21, 2019, http://archives.library.yorku.ca/items/show/1701.